Our customers use our product to enhance their employees' productivity, efficiency, and the company's bottom line. Read on for the many reasons to choose Segway® PTs for your commercial application. Starting, growing and maintaining a business of any kind is challenging on a variety of fronts. Undoubtedly, one of senior management's prime objectives is to determine how to maximize their team's productivity. Well, have we got a practical tool for you! Today, the PT has been deployed in vast facilities all across the globe and is being used to improve mobility, visibility and efficiency by large facility managers, warehouse executives, airport personnel, agricultural property staff, contracted security personnel and more. Mobility– The PT can travel up to 12.5 mph/20 kph and allows riders to cover 9x more area, 3x faster than on foot. Visibility– The PT's base adds 8" of height. Managers can oversee a larger area and be seen, which improves overall productivity. Responsiveness– The Segway PT allows riders to travel up to 24 miles/38 km on a single charge and arrive at a destination quickly and without fatigue. Versatility– A PT can easily and quickly travel indoors and outdoors, up hills and ramps, over curbs, into elevators and through doors. Cargo options enable riders to carry whatever they may need. Maneuverability– The Segway® PT's true zero turning radius allows it to easily maneuver in very tight spaces. It can pivot within its own shoulder width footprint and transition seamlessly from forward to reverse. Energy Efficiency– The PT is powered by Lithium-ion batteries. There is no need for gas, just plug the PT into a standard outlet to fully charge or top it off. It's an environmentally friendly way to move that delivers energy efficiency equivalent to 450 miles per gallon and operates for just a penny per mile based on 10 cents per kWh. Whether you're managing a concert, sporting event, or festival, the Segway® PT has proven itself as a time-saving tool when you're needed across large areas. Our customers in this market range from concert tour management, concert merchandising personnel, festival or fair personnel, and concert promotion executives. The most distinguished advantage the Segway® PT has is its capability to go in and out of doorways so it becomes available for indoor and outdoor use. If you are interested in how this might apply to your event, we will be more than welcome to come and do an on-site demo during your event or an on-site demo for your personnel to better understand the advantages it has for this line of work. Our biggest customer is a utility company and their results from acquiring the Segway® Personal Transporter (PT) as their meter reading mode of transportation is incredible! 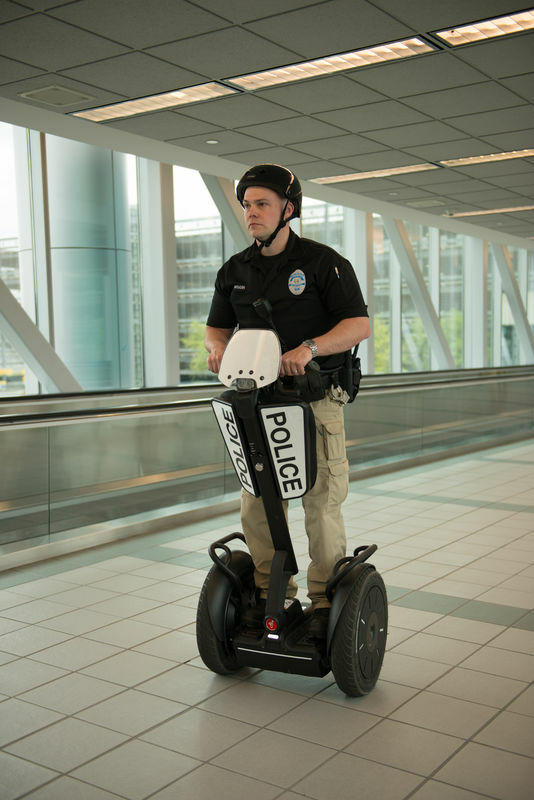 They found that Segway® PTs pay for themselves after three months of productivity. That's incredible results for a utility company that focuses on efficient meter reading and responsive transportation! It has helped produce strong results on their bottom line and also helped reduce larger asset purchases such as trucks and other vehicles. There's not much more we can say for this, it truly speaks for itself. If your organization is seeking to improve employee productivity and response time, maximize your workforce and reduce their fatigue, the Segway® Personal Transporter (PT) is a proven solution. The efficiency and maneuverability of the Segway® PT will change the way that you move through the long tiring concourses. Airport officials will be able to cover more area dramatically increasing the efficiency of personnel moving through your facility.